Stop sweating and struggling when moving large heavy objects. Don't spend another day straining your back to move large boxes, heavy equipment, furniture or anything else. Use Gliders to reduce effort by up to 90%, and say goodbye to excessive effort forever. Instead of grunting and groaning, you will be smiling and singing as you get the job done in way less time, and with only a small portion of the effort. The concept behind these handy little triangles is quite simple. They are similar to traditional furniture sliders, but far more useful thanks to some advanced characteristics. 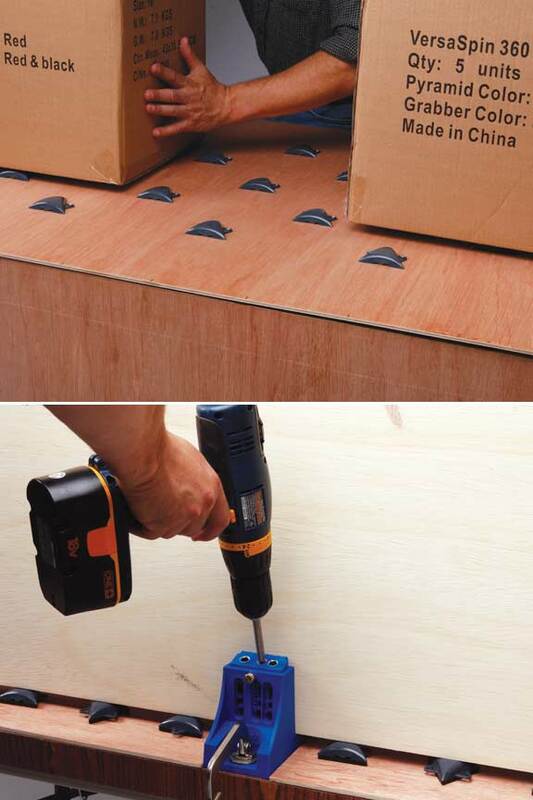 Connect them together, mount them to the object, secure to flooring, benches and other work surfaces, or pair with Grabbers for even more versatility. 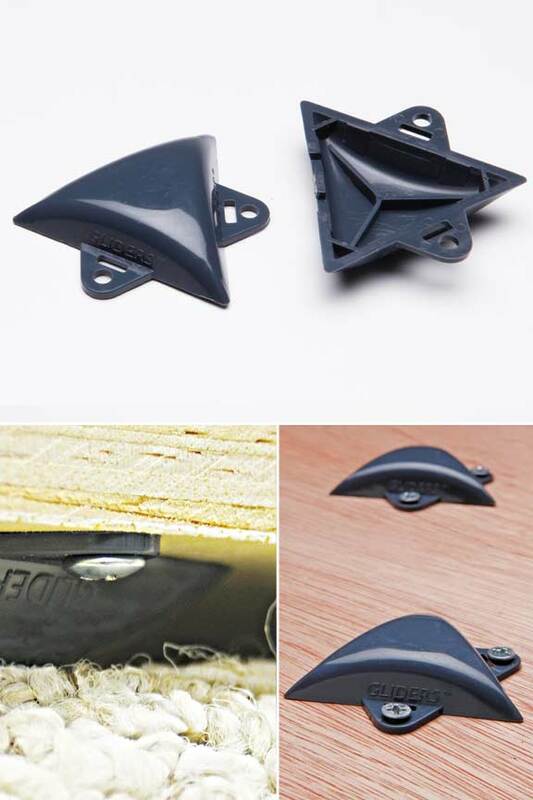 A triangular shape makes these things pretty strong, but the high density plastic they are made from ensures that they will be able to support the weight of any object you put on top. Even when driven over by a full size SUV, these will not break or lose shape. The specialized material is also resistant to abrasion, so you can be sure that the finish will stay smooth and free of blemishes for a long time. This means that you will have a permanently slick surface that is strong enough to handle any job. If you have a heavy object that it moved frequently, mount some to the bottom to reduce friction and make sliding it easy. Maybe you move heavy objects over the same surface regularly. Mount some directly to that surface in order to slide those same objects with a much more gentle touch. For moving an object once, or for a less permanent method of use, simply pair with a Grabber to create a triangular tool that is grippy on one side and slippery on the other. 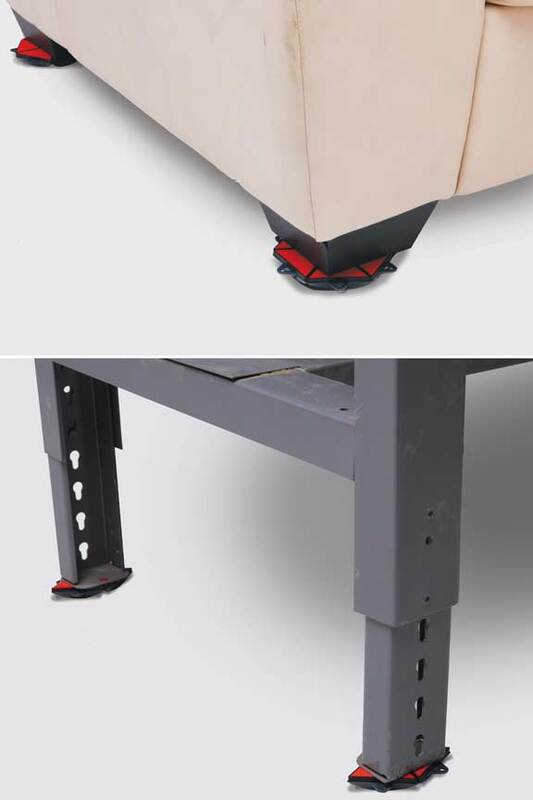 For appliances, machinery, workbenches and other heavy objects that you move on a regular basis, simply secure a glider to the bottom of each foot, or in some other even configuration. The integrated holes make screwing them in easy, so you can install quickly and then leave them there permanently. Once in place, you will eliminate back pain and other annoyances associated with moving these kinds of objects. When gliders touch the ground instead of the object, friction is greatly reduced, so you can use almost 90% less strength and effort to move the same object. 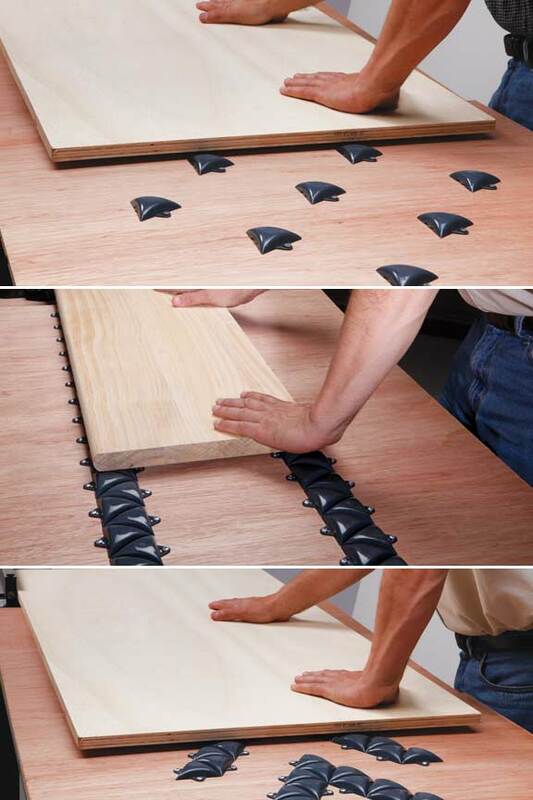 As an inexpensive alternative to roller belts and other similar work bench surfaces, you can mount several of these directly to any surface to make it permanently slick. Instead of struggling with alignment, or fumbling due to friction, objects will be able to glide effortlessly across your bench or table in order to increase precision, reduce effort, and all but eliminate frustration. This type of application is ideal for assembly line style working environments, small shipping operations, as a board feeder for woodwork and more. Many different configurations are possible, so you will be able to design the perfect surface for your exact job. You can even combine Gliders together for large circular surfaces, double wide triangles and more. These highly versatile friction reducers are sure to improve results and make the job easier, no matter how you use them. Pop one of these guys onto the top of a Grabber and you increase versatility greatly. Now you have a less permanent option because you are now holding a triangle that is high friction on one side, and low friction on the other. This means that when slipped under a piece of furniture or other heavy object, one side will grip the object, and the other side will allow it to glide across the floor when pushed. Using the same technique, you can also set up a temporary work surface that is super slick. If you have ever wished that that your counter top had rolling wheels, the combination of these two products can achieve similar results. The setup is fast, and you can take it down whenever you want. This feature is ideal for anyone with limited space or budget. Quickly connect Grabbers to Gliders and set the rubberized side face-down and it will grip the surface to remain in place. Objects passed over the slick surface on top will glide easily in any direction you choose. Order Yours Today! Dimensions 2.375" x 2.375" x .25"
Uses Elevate objects and prevent them from slipping sliding or moving in any way. Connectable Yes - Stick several together for the perfect size and shape surface. Mountable Yes - Secure directly to objects, or mount to your work surface. Elevate Projects Yes - Raise objects by .25" when on top. Grabbers - The fast and easy way to keep things stationary while you work. Don't waste time with clamps when sanding or drilling. Use these little triangles instead and finish the job in less time. Order Yours Today! High Capacity For Long Lasting Performance. Doubles As A Nightlight and Humidifier. 100% Pure. An intense minty scent. Add a fresh fragrance to the air, make your own mouthwash, or use medicinally. A mix of sweet lemon and herbaceous scents. Refresh a stinky room, repel insects, relieve pain, reduce inflammation and more.